In terms of the number of reels of film, the Mary Lou Dietrich Collection is one of the largest I‚Äôve worked with. 154 reels, but they only come to about 7000 feet of 8 mm film. Each reel translates to less than four minutes when viewed. The collection was filmed by Mary Miller Dietrich, M.D., and her husband Albert G. Dietrich. The films follow the family as their children grow to adulthood, from first days of school to attending the White House Conference on Youth. 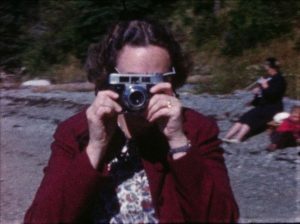 The collection also includes scenes of family trips across the US, to Canada, and to Denmark. 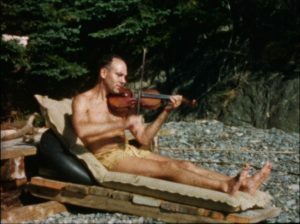 There are also many scenes of the family camp in Cape Rosier, Maine. Mary Miller Dietrich was born in Boston, Massachusetts on August 17, 1919. She studied at Mount Holyoke College and Tufts University Medical School, obtaining a medical degree in 1945. Early in her career she maintained a private practice at her home, later working at the University of Maine, Eastern Maine General Hospital, and St. Joseph‚Äôs Hospital in Bangor. Albert G. Dietrich was born in Pittsburgh, Pennsylvania on January 4, 1914. A social worker with a degree from the University of Pittsburgh, Albert worked with a number of organizations across the mid-west. He was a conscientious objector during World War II, working with the Civilian Public Service. In Maine, Albert continued working as a social worker, while also working as a teacher at the University of Maine, the Bangor Theological Seminary, and Bangor Community College. Over the years he served on a number of boards and committees relating to mental health issues, including serving as Chair of the Committee of Child Welfare. The ideals of the Dietrich‚Äôs careers in social work and medicine also translated into their private lives. They were friends, neighbors and proponents of activists Scott and Helen Nearing, whose homestead at Harborside, Maine can still be visited. Now called the Good Life Center, the farm is open to teach sustainable living practices and promote the Nearing‚Äôs legacy. Briefly visible on one reel is another activist: Peace Pilgrim. Born Mildred Lisette Norman, Peace Pilgrim walked across the United States seven times over the course of 28 years in order to promote world peace. She was known for wearing her iconic blue vest with the words ‚Äú25,000 Miles on foot for peace‚Äù written on the back. 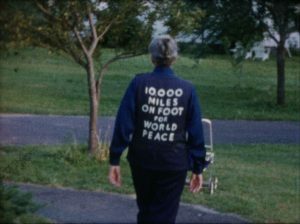 In the Dietrich film, she is seen earlier in her career, with the vest reading ‚Äú10,000 Miles on Foot for World Peace‚Äù. Only her back is visible, as she sets off down the road. The Dietrich‚Äôs passed their social conscience on to their children. 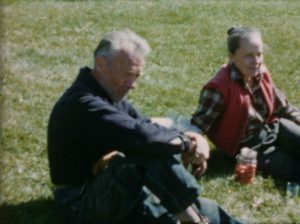 Several reels feature their children attending the White House Conference on Youth at the YMCA of the Rockies at Estes Park, Colorado in April of 1971. The Conference, which focused on issues relating to 14-24 year-olds at the height of the Vietnam War, was famously snowed in by a late storm, prompting the US government to send out the army to deliver the appropriate winter gear. Mary and Albert Dietrich were married for 55 years, until Albert‚Äôs death in 2002. Mary passed away in 2004. The couple had three children: Mary Louis (Mary Lou), David, and Mark. Their films were donated by Mary Lou. There was some debate in including the Dietrich films in the Woman Behind the Camera project, as they are not exclusively filmed by Mary. However, both Mary and Albert appear on camera enough that it is apparent that they were taking turns filming, and that film making was a shared, family endeavor.